The Portrait de Suzanne Bambridge (1891) is the first oil painting executed by Paul Gauguin (1848–1903) in Tahiti. A comprehensive material study of the painting by means of MA-XRF, Raman and FT-IR techniques has been conducted to understand Gauguin’s practice. The obtained results allowed collecting unexpected material evidences, which suggest restoration and subsequent addition made by Gauguin himself. Moreover relevant compositional information has been provided that has influenced the decision-making process during the restoration of the painting as the removal of the old varnish and the overpaints, dating from undocumented past treatments, turned out to be much more complicated than expected. While X-ray radiography and multi-spectral imaging methods could not give sufficient information, overpaints and original paint layers have been distinguished through this multi-analytical approach. The Portrait de Suzanne Bambridge (oil painting on canvas, 1891, 50 cm × 70 cm, Inv. 4491) by Paul Gauguin (1848–1903) (Fig. 1), which is owned by the MRBAB/KMSKB (Musées Royaux des Beaux-Arts de Belgique/Koninklijke Musea poor Schone Kunsten van België) has been going through an in-depth restoration process, made possible thanks to a campaign of crowd funding. Executed in 1891, in Tahiti, this female portrait is recognized as Gauguin’s first Polynesian oil painting. The portrayed woman, Suzanne Bambridge, was an English dignitary living in Papeete. In the focus exhibition Kokoschka and Gauguin unravelled. See the invisible (RMFAB, 22. 07. 2014–25. 01. 2015) the curator Frederik Leen pointed out the similarities between the portrait of Suzanne Bambridge and the attitude of Queen Pomaré IV in the portrait realized by the Papeete based-photographer Sophia Hoare, dating from 1878 (see Additional file 1: Figure S1). During the stay of the French painter in Tahiti, this black and white photograph of the Tahitian queen, was largely diffused in the form of visiting cards (RMFAB, D.O. inv. 4491). According to the museum archival records, the painting has been brought to Paris after Suzanne Bambridge’s death in 1912, where it joined a private collection until its acquisition by the MRBAB/KMSKB in 1923. The work was already deeply restored when acquired by the Belgian museum. The overall paint surface was affected by multiple and heterogeneous overpaints, often visually disturbing. Some of them have been applied to dissimulate the cracks caused by the roll up state of the picture during its transportation from South Sea to Paris. In the frame of this restoration campaign, the removal of the old varnish and the overpaints dating from undocumented past treatments has been decided. This task quickly turned out to be much more complicated than expected since, overpainted areas and original pictorial layer cannot be always distinguished throughout the dress and the background, despite the x-radiography and the multi-spectral imaging techniques previously applied. Furthermore, There was a question about the attribution to Gauguin of the clumsy right chair stile, suspected of being a late addition. The dirty grey paint layer observed in the red cloth and in three floral patterns of the dress (on the right side) addresses an additional conservation issue. Indeed, the dirty grey color that appears not compliant with the surrounding red colors, most likely results from a discoloration phenomenon. In order to provide compositional information, which may feed the decision-making process in regards to the extent of overpainting removal, a comprehensive material study of the work has been conducted by means of MA-XRF , Raman  and infrared  spectroscopy techniques. XRF (X-ray fluorescence) spectroscopy was used in macro scanning mode (MA-XRF) with the CEA translation stage  and homemade XRF system [5, 6], made of a Moxtek Magnum X-ray tube (50 kV) (with a Ag anode), a detector X-123SDD Amptek (25 mm2), with a resolution of 130 eV to 5.9 keV. The XRF scan of the whole painting has been completed in approximately 35 h. Scanning step was set to 1 mm, speed to 3 mm/s. X-ray tube was set to a voltage of 40 kV and a current of 120 µA. Spectra were treated in batch mode using PyMCA , allowing to separate the signals from the different chemical elements. Micro-FTIR measurements were performed on fourteen micro-fragments sampled in areas of interest. The IR spectra were recorded in the 4000–650 cm−1 range. The spectrometer is a Nicolet Nexus FTIR provided with a Continuum microscope and an ATR Ge crystal. The spectral resolution is 4 cm−1, and the spectra were recorded with the automatic suppression of CO2 and H2O vapour bands. The sample sites and the overall FTIR results are given in the additional materials (Additional file 1: Table S1). The point analyses of the paint surface by Raman spectroscopy (RS) were performed by using the Enwave Optronics setup (portable Raman analyzer I-Dual-G), with a laser at 785 nm . Three RS spectra were acquired for each investigated site using the lowest laser power necessary to obtain valuable results (ca. 30 mW). The obtained spectra were treated using GRAMS AI™. All the MA-XRF and RS measurements were performed at the MRBAB/KMSKB thanks to the CEA portable instrumentation. The location of the thirty-seven points analysed by RS and the related results are presented in the additional materials of this paper (Additional file 1: Table S2). The multi-spectral high-resolution images previously acquired by Lumiere Technology, partly presented in 2012 APROA-BRK postprints  and the X-ray radiography performed by the KIK-IRPA were exploited in order to enhance the interpretation of the MA-XRF, RS and FTIR results. For sake of clarity, the MA-XRF, RS and ATR-FTIR results obtained from blue, white, yellow, green, brown, carnation, red/pink and purple areas are discussed separately. On the basis of the MA-XRF imaging results shown in Figs. 3a, b, the background blue involves mixtures of cobalt-based, copper-based and chromium-based pigment(s) admixed with lead white and zinc white. Cobalt blue has been positively identified by ATR-FTIR spectroscopy in two paint fragments taken from the background (see Additional file 1: Table S1). The Co distribution map suggests the presence of this blue pigment mainly in the upper-right background while Ultramarine and Prussian are most prevalent in the upper left. Ultramarine and Prussian blue were also identified, through point Raman spectroscopy analyses (see Additional file 1: Table S2). In comparison with the surrounding blue background, the three leaves depicted in the upper left corner of the painting are richer in Co element. Unlike the background surface, Prussian blue appears as the predominant blue pigment used for depicting the dress, although this one incorporates cobalt blue-based areas as well. The chromium distribution overall the dress suggests further yellow and/or green Cr-based pigment(s) for achieving the greenish blue shades. Unfortunately, it was not possible to determine if the detected pigments are mixed together or if they come from distinct paint layers. Only Prussian blue and Vermilion were successfully identified in the blue and red small brushstrokes depicting the edges of the dress in the red shirt region. The colours [in the painting] are bound to the support by a binder, which may be composed of either glue or oil. When they are old and therefore starved of oil, the perfectly dry colour is a layer, which is hard and porous. It goes without saying that all of the new oil [in the restoration] is little by little absorbed by the dry colour bordering the damaged area. From this come these brushstrokes, which yellow more each day. Make an experiment on a porous block of dry colour, for example Spanish white. Once undertaken, it will be obvious that oil is the enemy - Here is an alternative method - One must fill the holes with casein-bound paint, which alone is not attacked by humidity, not even being soluble in a prolonged bath of ammonia. It is not possible to match the neighbouring colour, but it is easy to finish by glazing with a glaze of oil paint degreaser with volatile spirits such as benzene or mineral spirits. The porous body disappears and a solid layer remains . The subsequent casein-based layers are, therefore, possibly from the Gauguin’s hand. As noticed for various other Gauguin’s paintings, the Portrait of Suzanne Bambridge displays dark blue outlines. The ones defining the face, the left chair stile, the yellow fabric behind Suzanne Bambridge, and the thumb are made of cobalt blue, while the contours of the rest of the hand, the sleeve in the wrist area and the folds of the dress were executed with Prussian blue. Prussian blue was found in combination with ivory black in the dark blue region down the sleeve of the dress. The MA-XRF maps of calcium and phosphorus (see Fig. 3a) led to the identification of ivory black in some other areas, including the hair and the dark outline in the Suzanne Bambridge’s right shoulder. Although, bone black (calcined animal bones) and ivory black (calcined ivory or hornes) have in common high contents in P and Ca elements, the presence of bone black in pictorial layer from 1891 seems more probable, since ivory black that is no longer available, was already hard to find at the end of the 19th century, and generally replaced by bone black . The concomitant presence of Ultramarine, Prussian blue and cobalt blue is compliant with the analytical studies conducted on other Gauguin’s paintings (e.g. Le Sorcier d’Hiva Oa, 1903, oil on canvas, 92 × 73 cm, La Boverie Museum, Liège, Belgium) , and with the blue colours ordered to Georges-Daniel de Monfreid [14, 15], who ensured the regular supply of the painting materials to the painter exiled in South Sea. Unfortunately, due to the use of similar blue pigments in overpainted areas, the distinction between past restorations and original part through elementary information was not conclusive. Like the flesh tones and the other light colours in the painting, lead white and zinc white were found together in the white items (collar and left sleeve border of the dress). 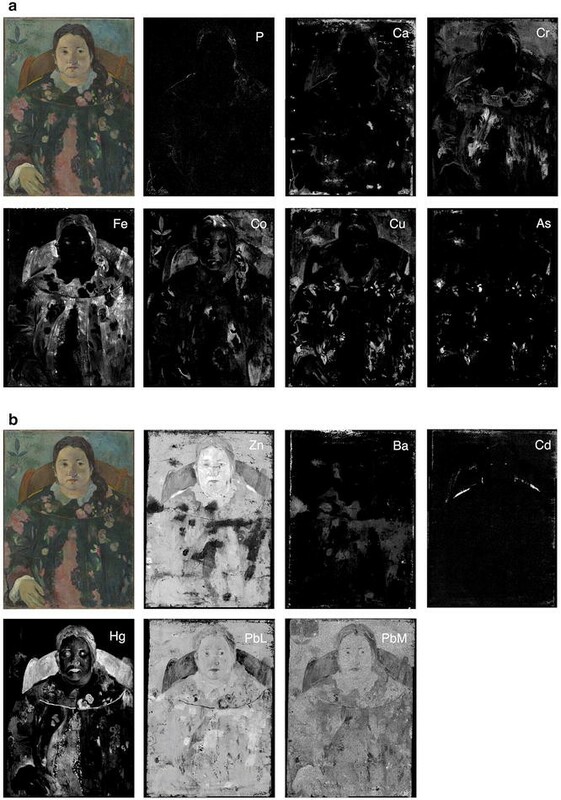 Because of the concomitant presence of both white pigments in the original paint layer, some overpaints and/or later paint layers, not visible through infrared reflectography and X-ray radiography imagery methods, clearly stand out through the MA-XRF maps of Zn, Pb and Ba, shown in Fig. 3a, b. Unlike elsewhere in the portrait, the signals of zinc become suddenly interrupted, making visible large brushstrokes independently oriented. Those are characterized by their high lead and barium contents that prevent the detection of the zinc beneath. Lead white and zinc white are predominant in the collar. Nevertheless, the MA-XRF elemental maps and the punctual RS analyses, pointed out the presence of additional pigments. While the obtained RS spectra allowed the identification of Prussian blue, the MA-XRF maps of cobalt, copper and arsenic indicate small amounts of cobalt blue, copper arsenic green and one further cuprous pigment. The greyish layer covering almost entirely the collar was sampled (Samples 5 and 12 in Additional file 1: Table S1), and analyzed by micro ATR-FTIR spectroscopy. Like for several other paint fragments taken from restored areas, the ATR-FTIR results led to the identification of casein as binding medium. Raman spectroscopy measurements led to the identification of chrome yellow in each of the five investigated yellow spots. Nevertheless, the MA-XRF results showed that the composition of the yellow earrings and the yellow fabric behind Suzanne Bambridge, notably differs from the ones found in the pale yellow features in the dress (suggesting floral elements). In the first case, the yellow colour primarily consists of a cadmium zinc sulphide/chrome yellow mixture, while the yellow features painted over the dress are made of lead white and barium sulphate, admixed with only very low amounts of chrome yellow, and no cadmium yellow. Prussian blue and barite mixed with casein were identified by ATR-FTIR in the sample taken from the greyish layer partially covering the rounded pale yellow item, painted over the dress on the left side (Sample 14 in Additional file 1: Table S1). As illustrated in Fig. 3a, the distribution of the arsenic and copper elements clearly appears correlated in most of the green areas. The concomitant presence of both elements evidences the use of Cu/As green pigment(s), for instance Emerald green and Scheele’s green. The frequent mention of Veronese green, a commercial name generally referring to Emerald or one of its variants , throughout the Gauguin’s writings [15, 17], evidenced the wide use of Cu/As-based green colours by the painter. Emerald green has been identified from numerous Gauguin’s paintings (at least seventeen), executed in France as well as in South Pacific . This one was also found in the green overpaints, attributable to Gauguin, in Van Gogh’s Self-portrait dedicated to Gauguin . The XRF scans recorded for Cu and As elements revealed the use of a similar green pigment in some areas considered as overpainted or retouched. For example, it was found in the darker and greener brushstrokes applied subsequent to the blue background (on the left side), but also in the greenish blue inpaintings above the signature and applied over chalk based-fillers (the MA-XRF map of Ca makes possible to stand out their presence in the whole painting). Emerald green oil colour was successfully identified by micro-FTIR, in the fragment taken from the small green leave painted over cracks after being filled, probably with a lead white/oil-based material. Offered by most of the artists colour makers since the early 1820’s, copper arsenic green pigments, more especially Emerald, were widely employed by many 19th century painters, e.g. Manet, Van Gogh, Renoir, Monet and Cézanne. Progressively abandoned since the very beginning of the 20th century because of their high toxicity, copper arsenic compounds are no longer available as artistic green pigments. 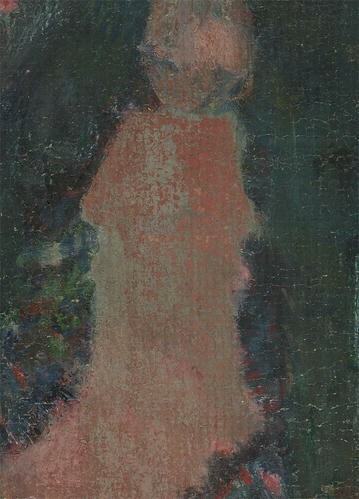 In the light of this fact, overpaints containing Emerald had been most probably executed before the painting entry in the MRBAB collection in 1923. In specific regions, including the right side of the background, the Suzanne Bambridge’s forehead, hand and collar, the copper does not seem combined with arsenic. These results suggest the presence of further Cu-based pigment(s), such as verdigris and verditer blue. Although, Verdigris does not appear among the colours names from the painting supplies ordered by Gauguin, the green pigment was previously identified in 1889 and 1890 paintings by the artist . In addition, as explained above, the greenish blue shades of the dress contain pigment(s) based on chromium. Viridian, chrome oxide green and chrome green (mixture of chrome yellow and Prussian blue) are potential candidates. By looking on the MA-XRF maps of Hg and Fe elements (respectively in Fig. 3a, b), one can see that the brown colours used to depict the wooden chair basically result from the combination, in variable proportions, of Vermilion and Fe-based pigments, most likely iron oxides-based pigments, such as earths and ochre’s. Interestingly, several elements contained in the left bar and in the back of the chair, including cadmium, cobalt, chromium and calcium, were not detected from the right chair stile, suspected of being added subsequent to the date of the painting execution. The right chair stile also differs through the presence of copper, without an apparent link to the arsenic element. In addition, the mercury signals coming from deeper paint layers make visible another right chair stile differently oriented. A close visual examination of the right chair stile allows observing it has been painted over the blue background, unlike its counterpart on the left. Another significant difference lies in the absence of dark blue outlines as those defining the left bar and the back of the chair. The noticed technical and compositional inconsistencies tend to evidence that the right chair stile is a later addition.1 The artist could have initially painted the chair with only one bar, as he did in further contemporaneous portraits. Indeed, on the basis of the comparative iconographic analysis, we can conclude that, from 1884 onwards, the artist preferably shows only one side of the chair on which the model is seated. During this decade, it becomes a recurrent compositional element in portraits, stimulating the visual integration of a three-dimensional object into a flat decorative surface. The virtual image of the painting without the right chair stile (using Photoshop), shown in Fig. 4, does not contradict this assumption. However, one must keep in mind that Gauguin, occasionally, undertook changes of a design element to satisfy his clients and then could be the author of the added chair element. The darker brown shades found in the Suzanne Bambrige’s hair seem richer in cobalt blue, although contents in Vermilion, ivory black and iron oxide(s) were also pointed out. Note the identification of casein by ATR-FTIR spectroscopy in the micro-fragment sampled in the hair area (Sample 4 in Additional file 1: Table S1). The flesh tones of Suzanne Bambridge’s face were achieved by mixing zinc white, lead white and Vermilion, in variable proportions. By examining the MA-XRF map of the L-lines of lead (PbL) in Fig. 3b, one can see that Suzanne Bambridge’s right ear was originally thicker. The application of brown brushstrokes involving Fe-based pigment(s) and barite, over the previous ear borders, has thinned the initial form. The whitish brushstrokes placed on the rounded areas of the face, used for creating volumes, are mainly composed of zinc white, while the bluish shadows of forehead, cheekbones, chin, eyes and nose are rich in cobalt blue. The MA-XRF map of copper (see Fig. 3a) and the greenish shades observed in the forehead and the hand, suggest substrate layers containing a cuprous green pigment, which, in a certain way, is reminiscent of the Verdaccio of the old masters. In terms of composition, the hand differs from the face through relatively high contents in iron (see Fig. 3b) and copper and much less contents in mercury and cobalt. The red cloth lying in the middle of the dress, which corresponds to the largest reddish area of the portrait, is rich in Vermilion and lead white. Zinc white was identified as well but in a lesser proportion. One can see by looking at the MA-XRF map of mercury given in Fig. 3b that the red shirt was first attempted larger. In the same way, the Hg distribution in certain areas of the dress suggests the presence of further floral motifs, hidden by the current blue top layers. Three paint layers can be distinguished in the shirt area, see the close-up in Fig. 5. Those include a sparse greyish layer based on Prussian blue and lead white, a flaking red layer containing wax, a red lake, probably Alizarin, Vermillion and lead white, and, finally, a light pink underlayer involving Geranium Lake (PR90:1), Vermilion and lead white. The origin of the wax identified by ATR-FTIR (see Fig. 6) in the micro-fragment taken from the flaking red layer (Sample #8 in Additional file 1: Table S1), most probably not original, remains uncertain. Obviously, the presence of wax can be explained by the use of wax as binding medium in the red layer, but it could also results from the migration of wax contained in a sublayer. Indeed, the use of wax as surface coating is mentioned in Gauguin’s correspondence. On the other hand, it has been reported that the painter may have mixed wax into oil-based paints . The FTIR identification in the light pink sublayer (Sample #9 in Additional file 1: Table S1), of Geranium Lake (see Fig. 7) well known for its fugitive nature, is in accordance with overpaints motivated by noticeable colour fading. 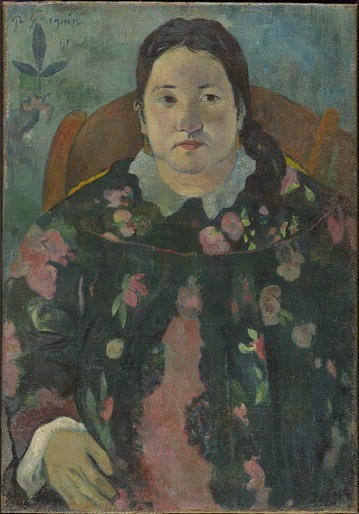 The fading of Gauguin’s red lakes has been diagnosed in the pink background of Portrait of Vaïte (Jeanne) Goupil, 1896 . Concerning the pink flowers, the MA-XRF results likely outline a predominant use of Vermilion and lead white. The lighter pink shades were achieved by adding more lead white and/or zinc white. Nevertheless, the Hg distribution is not always consistent with the visible shapes of the flowers. These findings support the use of additional organic red lake(s) for achieving pink shades, like those detected in the red shirt region. The mercury distribution found in the greyish flowers, on the right side of the dress, does not match with their visible shape. Prussian blue and casein were found together in the related paint layers, although the actual blue pigment cannot be used in alkaline media such as casein paints . This incompatibility could be at the origin of the current grey shades observed throughout the painting. Note that the concomitant presence of an organic red pigment/lake (even though not detected by ATR-FTIR and RS analyses) and Prussian blue cannot be excluded. The purple shades in the end of Suzanne Bambridge’s left sleeve (wrist area) were achieved by mixing Ultramarine, Vermilion and lead white pigments. However, the brownish purple flaking layer, painted over the brighter purple layer that can be reasonably considered as original, notably differs through the presence of wax in the mixture (micro-fragment 10 investigated by ATR-FTIR). The same combination of pigments, admixed with Prussian blue, was identified in the small rounded purple brushstrokes suggesting flowers in the collar area. The probability of one or more further organic pigment(s) in the purple areas cannot be ignored. The absence of cobalt violet (cobalt arsenates and cobalt phosphates) and manganese violet, both identified in contemporaneous Gauguin’s oil paintings, has to be noticed. The material evidences collected thanks to the multi-analytical approach substantially assisted the decision-making process of the restoration. On the basis of the technical and material inconsistencies noticed between the questionable right chair stile and its left counterpart, the first one can be reasonably considered as a later addition. As the right stile could have been made by the author himself, it has been decided to cover it with (reversible) watercolors-based inpaintings. 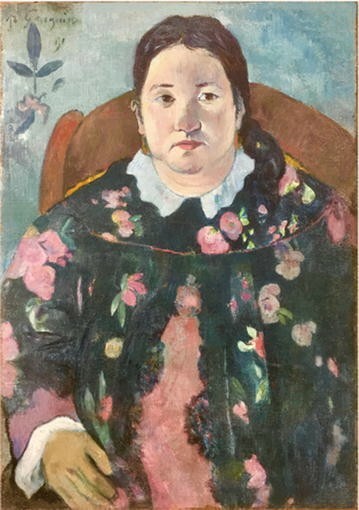 Although there is no documentary evidence of restorations and changes made prior to the shipment of the painting to Paris after 1912, the casein identification in several samples taken from overpainted areas appears fully compliant with the casein-based retouching method developed by Gauguin. In the light of this, it is assumed that Gauguin would have applied the casein-based paint layers in the frame of an early restoration campaign. The published Gauguin’s correspondence testifies the early poor condition of his Polynesian paintings, partly imputable to the detrimental effect of a tropical climate. If Gauguin had restored the Bambridge’s portrait, he had the opportunity to make composition changes. In other words, he could have added the right chair stile at the same time as the painting repairs he made, on his own initiative or on SB’s request. All the identified pigments, which also include those associated with later interventions are fully consistent with the Gauguin’s palette, known thanks to the painter’s writings and previous analytical studies conducted on some of his works. The MA-XRF scanning and the ATR-FTIR methods allowed distinguishing three types of overpaints (casein binder/zinc white free/over Ca-based fillers). More specifically, the obtained calcium distribution map that allowed visualizing the Ca-based fillers throughout the painting, made possible to localize all the related overpaintings. This outcome has notably facilitated their removals during the cleaning process. On the other hand, the identification of Prussian blue and lead white in association with a casein binder, in the greyish top layers, appeared highly relevant concerning the diagnosis of discoloration. Indeed, Prussian blue cannot be used in alkaline media, such as casein paints, without turning into a dirty grey-brown color. Because of this incompatibility, undesirable color changes, certainly took place in the paint layers involving both, casein and Prussian blue. However, the discolored areas were not retouched because of the lack of knowledge about their original appearance. In conclusion, the case of the Suzanne Bambridge’s portrait perfectly exemplifies the interest in collecting material information before and during the restoration process and the essential need of using complementary analytical methods. In 1891, a seated model is for the first time shown in front of a flat surface, oval at the top (W420). All references to furniture are omitted. See: Wildenstein G, Paul Gauguin. Catalogue I, Les Beaux-Arts, Editions d’études et de documents, Paris 1964. Cat. Nr. 94, 95, 138, 240, 298, 319, 387, 388, 420 and further. W420: Vahine no te tira. Femme a la fleur/Woman with Flower, 1891, oil on canvas, 70 × 46 cm, Ny Carlsberg Glyptotek, Copenhagen. CD, EH and DS have realized the in situ measurements (XRF and Raman spectroscopy), CD and BG anf realized the micro-sample analysis, CD, FV, FL, EV and EV have interpreted the results of the analysis, CD, FV and EV have discussed the restoration process. All authors read and approved the final manuscript. The authors sincerely thank Michel Draguet, General Director of the Musées Royaux des Beaux-Arts de Belgique/Koninklijke Musea poor Schone Kunsten van België, for his commitment that greatly assisted this research. Funding Musées Royaux des Beaux-Arts de Belgique/Koninklijke Musea poor Schone Kunsten van België, University of Liège and Gingo, Baillet Latour Fund, the Maecenas Circle, Become a Friend and all sponsors involved in the crowdfunding campaign for the restoration of the Portrait de Suzanne Bambridge by Paul Gauguin. 40494_2018_188_MOESM1_ESM.docx Additional file 1. Additional figures and tables. Price BA, Pretzel B. Infrared and Raman users group spectral database. 2007 ed. Vol. 1 & 2. Philadelphia: IRUG, 2009. www.irug.org. Accessed 20 June 2014. Defeyt C, Strivay D. Etude technique et matérielle des tableaux liégeois. In: Catalogue d’exposition L’Art dégénéré selon Hitler. La vente de Lucerne, 1939, éd. Collections artistiques de l’Université de Liège, Liège, 2014, http://hdl.handle.net/2268/191489.